The study, in macaques reported impaired neurological development in young monkeys following vaccination with a thimerosal containing vaccine. Prior to 2005, CS and AJW acted as paid experts in MMR-related litigation on behalf of the court retained by plaintiff lawyers. LH has a child who is a petitioner in the National Vaccine Injury Compensation Program. For this reason, LH was not involved in any data collection or statistical analyses to preclude the possibility of a perceived conflict of interest. As a working scientist, I participate in the peer review process. To me, these conflicts of interests are serious enough to enquire of the editor if the paper should be rejected on these grounds alone. I also can’t help but wonder if the reviewers did any background searches for Wakefield. If they had, my suspicions are this paper would never have been published in the first place. I certainly hope this means that the studies he is about to publish, as referred to by Generation Rescue below, never see the light of day in a peer reviewed, respectable journal. Whilst Neurotoxicology is indeed a respectable journal, it is albeit, small fry. With an impact factor of 2.409, it is certainly not a big hitter in the journal stakes. 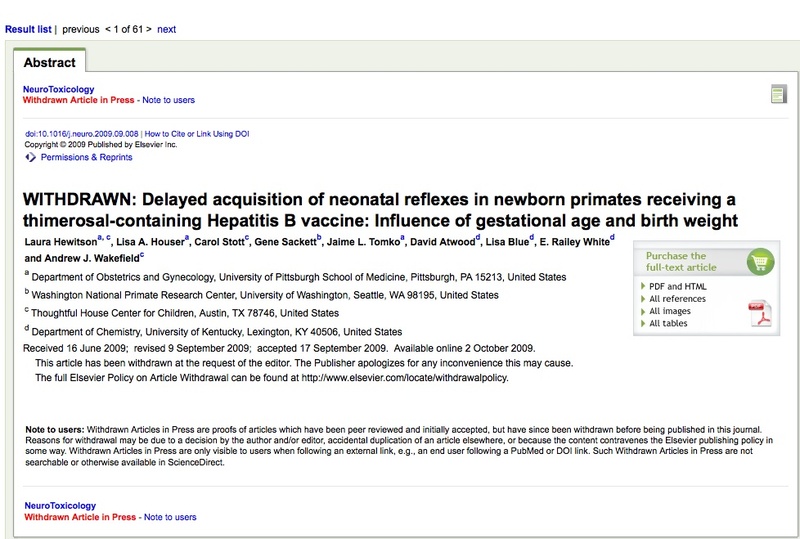 By comparison, The Lancet, which last week, retracted Wakefield’s notorious 1998 paper, has an impact factor of 28. The fallout from the study for vaccine makers and public health officials could be severe. 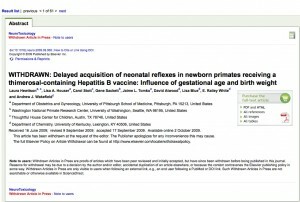 Having denied the possibility of the vaccine-autism connection for so long while profiting immensely from a recent boom in vaccine sales around the world, it’s no surprise that they would seek to repress this important work. 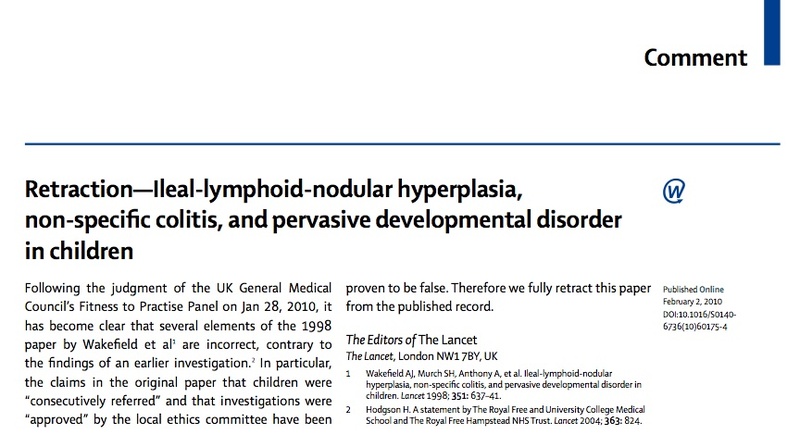 Although the editors of Neurotoxicology do not explain why they withdrew the paper, it seems likely that the GMC findings describing Wakefield as not only being wrong about the science in the Lancet paper, but also acting unethically with respect to using unnecessary and invasive procedures on children, are likely to have influenced their decision. He was also described as “unethical”, “callous” and “dishonest”. With this third blow to Wakefield’s reputation in a week, the anti-vaxers have finally conceded that he was wrong about vaccine safety, accepted that he had multiple conflicts of interest which he did not declare and disassociated themselves from him. 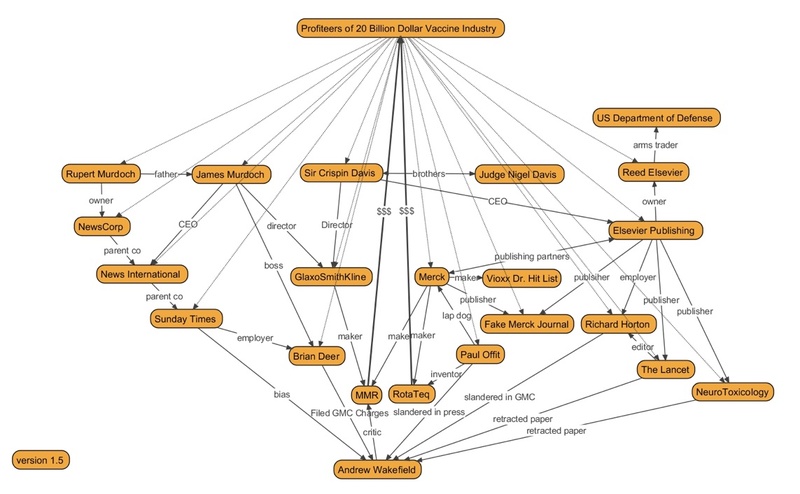 Instead they made a BIG FLOW CHART detailing the conspiracy designed to quash “one of the world’s most respected and well-published gastroenterologists.” Click for a high resolution image. 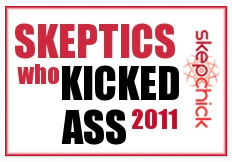 And they’ve also announced that they will republish the Lancet paper in the online quack-fest that is Medical Veritas. As yet, I have not seen any statements from Jen and Jim but, rest assured, it won’t be long before they start screaming conspiracy.